Below are some of the programs and activities offered at the Academy. Since we follow an emergent curriculum, we are often given the challenge of continually coming up with new ways to engage the children. 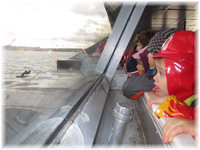 These are just a few of the many activities your child will participate in at the Academy. 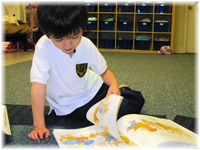 Quiet reading time is a time where children develop their ability to focus, take in information, and develop the foundational reading skills like how books are read, the connection between text and pictures, and the idea that the words represent the story. Older children will begin recognizing common words, and developed children will be able to literally read. Experimentation is the essence of discovery. 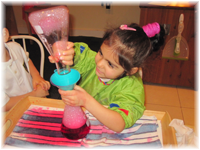 Children in all programs are given ample opportunity for experimentation. We strongly feel that learning by doing, observing, and reflecting on experiments is one of the most effective methods of education. It has long since been an established fact that music is one of the most enriching and beneficial experiences one can provide for a child. 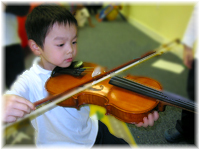 By stimulating the mind, facilitating social interaction, and giving insight into the ideas behind music and sound, Music becomes an integral part of any strong curriculum. 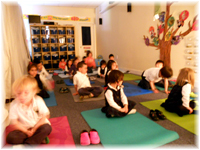 Distinct from Physical Education listed below, Yoga is the development of more than just the body. By becoming able to control your emotions and level of calm, by learning and remembering different stances and positions, and by becoming aware of their bodies, children learn discipline, self control, and coordination. Many adults take for granted the varied abilities they possess. Children benefit from exposure to a wide assortment of physical activities including games, sports, exercises, and other activities. 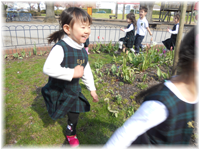 Children have a high amount of energy and enthusiasm and it's important to channel this energy into developing Gross Motor capabilities. To get out of the classroom, be part of the community, experience new things, and broaden one's horizons - that's what a good field trip is all about. The Children's Festival, Waterparks, concerts, and other seasonal or commercial events are of course good destinations, but you will also find us strolling through the neighborhood, getting a healthy treat at the local cafe, or going on an adventure to eat lunch at the North Vancouver Quay. Field trips are all about diversity and adventure!